Welcome to Florida Genetic Center, for more information about our products call (305) 599-6125. 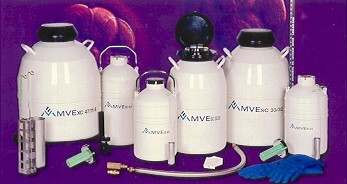 Liquid Nitrogen Freezers by MVE. The SC series is designed for the user who has small capacity needs, but requires long-term storage and low liquid nitrogen consumption in a convenient lightweight package. By integrating features users requested with the widest variety of holding times and storage capacities, MVE Aluminum Freezers are the units of choice. 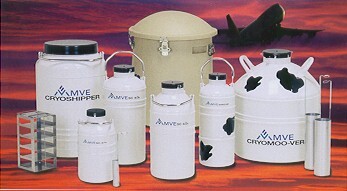 The MVE Vapor Shipper containers are designed for the safe transportation of biological samples at cryogenic temperatures. Fabricated from durable, lightweight aluminum, they contain a hydrophobic absorbent that contains the liquid nitrogen. The absorbent also repels moisture and humidity, assuring the maximum holding time. The Vapor Shipper containers are designed for the safe transportation of biological samples. The XC and SC series are designed for the user who has small capacity needs, but requires long-term storage . 1, Number of 1/2 cc straws (10/cane): 280, Liquid Nitrogen Capacity : 3.6 liters, Static holding time : 14 days, Neck opening 2.75", Overall height 18.4", Outside diameter 8.7", Canister height 11", Canister diameter 2.62", Weight empty 11 lbs, Weight full 18 lbs. Number of Canisters= 6, Neck Opening= 2 in, Number of 1/2 cc Straws= 540, Overall Height= 25.7 in, Liquid Nitrogen Capacity= 20.5L, Outside Diameter= 14.5 in, Static Evaporation Rate= .09L/day, Canister height= 11 in, Normal Working Days= 142, Weight Full= 62.5 Lbs. Number of Canisters= 6, Neck Opening= 2 in, Number of 1/2 cc Straws= 720, Overall Height= 16 in, Liquid Nitrogen Capacity= 3.6L, Outside Diameter= 8.7 in, Static Evaporation Rate= .12L/day, Canister height= 11 in, Normal Working Days= 19, Weight Full= `14.4Lbs. Number of Canisters= 6, Neck Opening= 2.75 in, Number of 1/2 cc Straws= 1260, Overall Height= 26 in, Liquid Nitrogen Capacity= 33.4L, Outside Diameter= 18.2 in, Static Evaporation Rate= .14L/day, Canister height= 11 in, Normal Working Days= 154, Weight Full 94 Lbs.